Abdullahi Umar Ganduje was born on December 25, 1949 at Ganduje village, Dawakin Tofa Local Government Area of Kano State. Abdullahi Ganduje started his first school experience with in Qur’anic and Islamiyya school situate at Ganduje where acquired Islamic knowledge. Later he moved to Dawakin Tofa Primary School from 1956 to 1963. After his primary education, he attended Government Secondary School Birnin Kudu where he studied between the years 1964 and 1968. For his tertiary education, Dr. Ganduje first attended Advance Teachers College Kano between 1969 and 1972, where obtained Nigerian Certificate of Education (NCE). Thereafter, he got admitted into Ahmadu Bello University Zaria where he obtained his Bachelor degree in Science Education after studying there between the years 1972 and 1975. Ganduje proceeded for a post-graduate degree immediately and obtained his first Masters degree in Applied Educational Psychology from Bayero University Kano in 1979. Between the years 1984 and 1985, he went back to Ahmadu Bello University Zaria, where he also got his Masters in Public Administration. He took one step further in the University of Ibadan, for his PhD in Public Administration between 1989 to 1993. In the year 1979, Abdullahi Umar Ganduje ventured into politics by joining the National Party of Nigeria (NPN) where he served as the Assistant Secretary for Kano State between the years 1979 and 1980. Later, Dr. Ganduje became the deputy governor of Kano State under the umbrella of People Democratic Party (PDP) when he deputized Rabiu Kwankwaso between the years 1999 and 2003. He once served as the Commissioner for Local Government. He was the special Adviser (Political) to the Minister of Defence of the Federal Republic of Nigeria between the years 2003 and 2007. 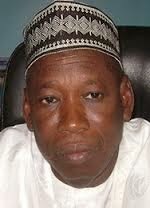 Ganduje was a member, Nigerian Civil Aviation Authority (NCAA). At a time, he served as the Executive Secretary Lake Chad Basin Commission at Ndjamena, Chad Republic. Ganduje was very prominent when he took part in the 2006 Nigerian Political Reforms Conference. In April 11, 2015, Abdullahi Umar Ganduje contested for and won election as governor of Kano State of Nigeria under the platform of APC.